Cooler air. The right hand side of the building now muffled by a large black plastic sheet. The building has a cupped hand over one ear.. Thinking about the order of remembering and sound loops..
A circle, a metal bowl. A circular walk, and a decision to remove my shoes, feel the floor. Somehow pure and illicit at the same time. I look up and see that I am surrounded by women of stained glass,with elongated feet and almond shaped toes. 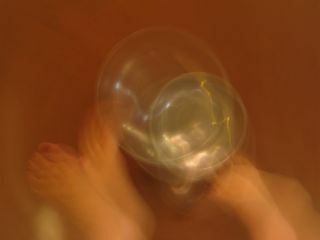 Movement has entered the frame, as has rituals ( I light a candle on arrival) circles, paper, and I am..barefoot. And now I am no longer alone. 3 window restorers, 3 volunteers, 1 child, 3 brooms, a hoover, and the hissing of a microphone left on.. The order of remembering. I recall being in a church, of watching the dust particles swim and slip in the light..somehow mesmerising ..particles and chords..
A resonating space, a listening space.. Inspired through my discovery of ORA, a ‘Voyage into Listening’ by Salome Voegelin and Daniela Cascella (Resonance FM), and prompted by self initiated ideas from a Dutch persepctive as part of a Transnational Symposium- ‘Ici et La’, I contacted the Deacon of the church, Jill Hartman, who is also an artist. One email and two very positive conversations later, I find myself standing in the middle of St John’s Church, St leonards on Sea, at the beginning of a 6 month self intiated artist residency. I have become particle in this cathedral like space.. In order to pass hesitation, to allow for slippage, for new things to come into view, I listen, attempt to listen. A soundscape that is creating a circle. Wind-gulls-cars-no sound buffer of green or distance. Rise and fall with a middle ground of gravel. It gives me the feeling of being on an island, like being a hostage, being able to hear the outside space whilst being cut off. Someone tells me that the original building was round. I start to walk in circles, echoeing and tracing an imagined footprint of the first building on this site. I do not yet know its actual location, so there is a fiction here. The circular walking is grounding. 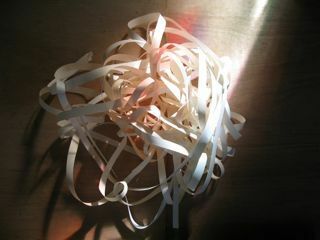 I take many photos documenting light, shadow, text, paper, and paper strips/nests that I bring with me.